Enjoy the appeal of high-end floor coverings at a lesser cost by selecting laminate flooring in San Marcos, CA, for your home. Our local showroom offers an extensive selection of stylish laminate flooring that looks just like hardwood plank or ceramic tile, but with cost-effective pricing and easy care and maintenance. Visit our showroom to see samples. Whether you prefer laminate wood flooring or laminate tile flooring, we provide a wonderful selection of brands, styles, textures, and colors. Reputable brands names that we carry include Floorcraft and Star Values. Your flooring must meet the requirements that you have on your shopping list. You want it to be beautiful, durable, and easy to care for. Laminate floors meet all of your needs. This type of flooring is made to perform to demanding standards as laminate is made of layered construction. A sturdy tread layer on the top provides protection. Underneath this is the design layer, which contains a high quality picture of a hardwood plank or ceramic tile. This is what makes laminate look so realistic. Following this is a layer of high-density fiberboard, backed up with a layer that guards against moisture. Let us show you samples of laminate that looks like it came right from a tree. Our brands and styles of wood laminate are realistic down to the smallest detail. You see the variation, grain, and gloss of real wood because you are looking at a picture of a hardwood plank. 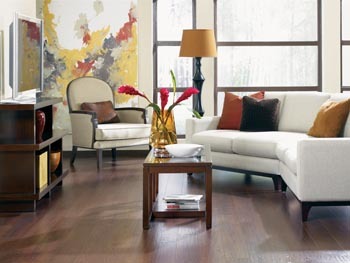 Our customers love laminate because it offers versatility, style, and durability. You can install laminate flooring in any room of your house. You do not have to shy away from rooms that have high levels of moisture, such as the basement, kitchen, or bathroom because laminate is made to resist water. Tile is a perennial favorite for flooring. However, you may want floor coverings that look like tile, but are made from high-performance materials. Laminate tile is the perfect option. Laminate flooring possesses all the visual appeal of tile, but is lighter in weight and needs no grout. Plus, it is easy to clean. Just sweep and damp mop with a product made for laminate floors. We invite you to consult with our design and sales professionals, either in the store or on the phone. Ask our experts all of your questions about the benefits of laminate tile flooring. Let us show you samples in the store or you can browse the site for selections. We are happy to guide you every step of the way—from selection to installation. When you want your floor coverings to look good and last long, choose professional laminate flooring installation. We schedule a team of professionals to come to your home with your flooring and the tools and equipment they need for installation. Depending on the brand of laminate, it is possible to install over your existing flooring, but the surface must be clean and level. Our installers use their years of experience, as well as industry best practices, to install your flooring. They measure accurately, make clean cuts, and ensure the laminate is secure and stable. This keeps it from shifting about and tearing. With work from these experts, your laminate wood or tile flooring proves to be lovely and long-lasting. Contact us today to help you select high-performance laminate flooring for your home. We proudly serve customers in San Marcos, Carlsbad, Escondido, and Oceanside, California, including ZIP Codes 92024, 92129, 92130, 92067, and 92028.